Jonsigns is one of the UK’s fastest growing sign companies with excellence in the design, manufacture, project management, installation and maintenance of corporate signs and images. Within our 40,000 sq. ft. site, Jonsigns has areas dedicated to design, acrylic fabrication, metal fabrication, digital, vinyl, assembly, and quality control. With our skilled design, fabrication and national fitting teams, Jonsigns can provide for all your signage requirements. Our customers include blue chip companies with requirements for large volume roll outs of corporate identity across a variety of market sectors, as well as smaller customised requirements. Jonsigns have the resources, knowledge and appreciation of design that sets us apart from the rest of the sign industry. Our approach to manufacturing solutions is that of an experienced engineering company, not a labour intensive craft based manufacturer. Our company is built on reputation and some of our biggest clients have been trading with us for over 20 years. Quality that speaks for itself. 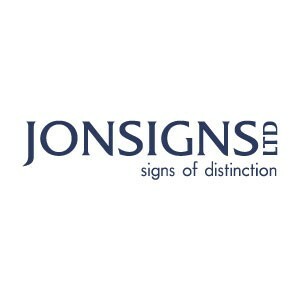 With over 20 years experience, at Jonsigns we have built our reputation on designing and manufacturing quality bespoke signage to meet our clients’ needs and do so in a friendly and professional manner. We keep abreast of new technology, allowing us to respond to tight deadlines whilst maintaining a high quality of service. We promote business practices that respect the environment and follow strict health and safety guidelines throughout all our departments and we are fully accredited. We are committed to customer service, excellence and attention to detail and, with nationwide coverage, we can provide for all your signage needs. To design, manufacture and install bespoke signs to an exceptionally high quality standard. Promoting business practices that respect the Earth and the Environment. To operate on a sustainable financial basis of profitable growth to enable expanding opportunities for development and career growth for our employees, and in turn initiating an improved quality of life.